It is very exciting here at our rabbitry whenever a litter of baby bunnies are born! Our large rabbits usually have the larger number of bunnies in their litter. Whether there are two baby bunnies born or 14 baby bunnies born we are always happy to spread the good news through our family and to our friends! Of course the first couple of days we only check the litter nest box to make sure the babies are alive, and all gathered together in the nest where they will be safe and warmly covered with their mother’s fur. Checking back to be sure none of the babies have crawled away from the nest is really important too. We keep records about the birthdate and number born in the litters. After two days we can see which bunnies are well fed by their fat bellies and make an effort to see that any runt gets fed too. The babies have fur coming in and we can tell what color and markings they will have. By the time they are 10 tens old their eyes are open and we are enjoying them even more. We are thinking of names for the bunnies and watching them wobble about on their legs too! Of course the bunnies all try out a hop or two and just like pop corn they quickly fly up into the air wildly soaring in various directions which stirs up even more lively leaping excitement in the litter box! 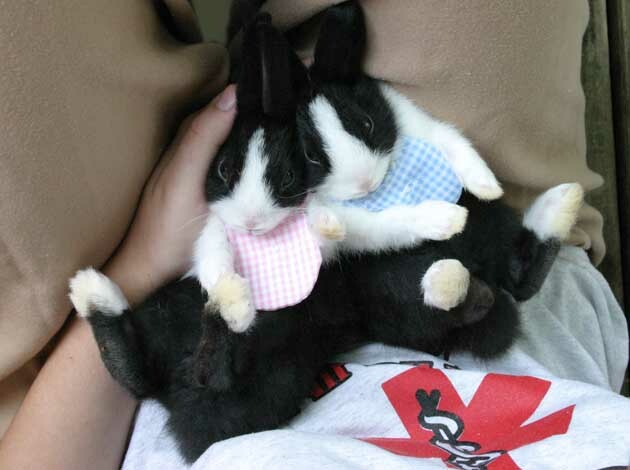 I make pink bibs for the girl bunnies and blue bibs for the boy bunnies! We love to take pictures to remember these happy times! They grow up so fast and in five – six months the Dutch rabbits are adults already! Our Rabbits Go To School! Our 2015 Garden Gate Rabbit Park Calendar!